During his recent visit to San Diego, LGBTQ rights leader Cleve Jones, a close confidant and protégé of the late Harvey Milk, said that queer people have a unique opportunity to resist the regressive perils of Trumpism. “I think Harvey would want to celebrate the amazing achievements we have accomplished in the last four decades,” said Jones, who was in town receiving a lifetime achievement award at the annual Harvey Milk Breakfast here. “But I think Harvey would caution us to be vigilant. We cannot take things for granted,” he stressed. Yet according to some activists, major multinational companies and Wall Street banks, not least among them Wal-Mart, Anheuser-Busch, and Wells Fargo Bank, take annual Pride celebrations for granted by trying to have it both ways, often sponsoring our opponents to a greater degree than they support our champions. It’s a situation that has San Diego equality activist Will Rodriguez Kennedy worried. Rodriguez Kennedy’s group is one of the largest LGBTQ Democratic clubs in the nation. In June of this year, as #ResistMarch was underway in cities nationwide, including one unrelated to Pride in San Diego that attracted 5,000 people, Rodriguez Kennedy’s organization initially withheld endorsement of a San Diego Pride as usual. Rodriguez Kennedy insists he’s not against all Pride affiliations with corporate America. National Equality March for Unity and Pride co-chair, San Diego City Commissioner Nicole Murray Ramirez says vigilance is indeed needed. But he isn’t convinced that the national queer resistance movement is harmed by San Diego Pride’s corporate affiliations this year—or that doing so is an endorsement for “business-as-usual” mood in 2018. As national co-chair of the Equality March in Washington, D.C., Nicole Murray Ramirez received reports about the degrees to which cities across the nation converted their Pride parades to resistance marches. Aside from Los Angeles, there wasn’t much resistance, according to him. That assertion runs contrary to other reports. 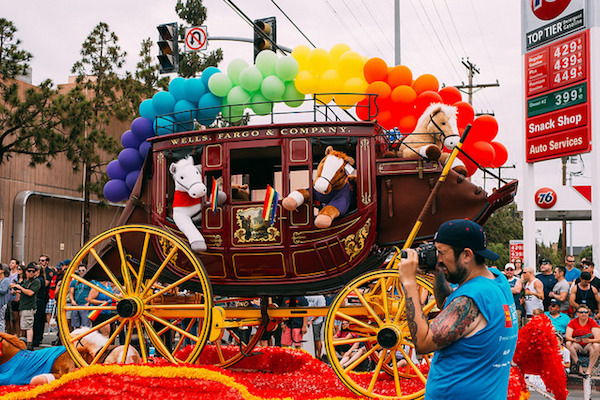 Inasmuch as San Diego organizers may be inclined to look to Los Angeles to shape their Pride parade, there’s a wealth of experience to consider. A veteran event producer himself, Pendleton understood the concerns of CSW’s board, which organizes L.A Pride. But understanding isn’t the same as agreeing. “…[A]fter seeing the overwhelming support from the Southern California community, they waived a bunch of rules, and invited me to join the board,” he said. It could be argued that L.A.’s march was as much a response to years of growing dissatisfaction and a widening perception that Christopher Street West had itself become over-commercialized, as it was a reaction to the potential perils of far-right forces taking over all three branches of government. But San Diego’s reputation as a more modest, milder-mannered metropolis than Los Angeles appears to be holding fast as thousands of visitors arrive for this weekend’s Pride events. Despite rumblings that self-proclaimed #Resistance protesters might show up to shadow the parade, San Diego Pride appears poised to call its tiny version of last month’s march in solidarity with L.A.’s #ResistMarch “good enough” for 2017. Brian Pendleton recognizes there may be differences between Los Angeles and San Diego.